As my bit part in the academic conference was over, I decided to walk into town following the Wascana Trail, just to see how far I could go in the two hours before my flight back to my life, back to Toronto. The path ran parallel to the river and marshes. I meandered along it as far as the back of Regina’s parliament building. Legislative, I should I have said. A woman whom I had asked the way underlined that the parliament was in Ottawa. The building was big and suitably impressive with its soaring towers and sandstone bulk. It looked like a castle. Except a castle to democracy has the wrong imagery in my mind. I walked around to the front of the building, heading for the main road. A group gathered for a formal photograph on the imposing front steps. They were mostly gray-haired men in suits and women in sensible skirts. As far as I could tell all were white. They joked and jostled as the photographer gave instructions on how to pose. Drifting around a bend in the path, I stopped. A make-shift camp was behind the hedges, with a couple of tents and chairs. What caught my eye was a huge home-made flyer with Indigenous Lives Matter printed on it. The flyer seemed to be made from half of a white sheet and it was attached to a tree. I was about to snap another souvenir photograph when I remembered my manners. This site mattered to someone. I called out hello. A voice answered from behind the hedges and told me to come around. I did so and met an Indigenous woman sitting in a chair. After greetings she asked if I was coming from the conference. I said yes and explained that I was out for a walk, heading for the airport. Her name was Richelle Dubois. She found her son at the bottom of Pilot Butte Creek, drowned in three feet of water. Her son, Haven Dubois, was 14 years old. The coroner ruled that it was an accidental death, from playing in the water. There was no investigation, no interviews with the people who were with her son that day, no nothing. Richelle Dubois said the ruling followed the same script when it came to Indigenous people in the city. It was always accidental or suicide. The woman found walled up in a sealed attic was deemed to have died by suicide. The one discovered in a laundry room, falling ten stories through a laundry shoot to her death, committed suicide too. Her family insisted on an inquest. This found that it was physically impossible for someone to climb into the laundry chute and lock it from inside the chute. 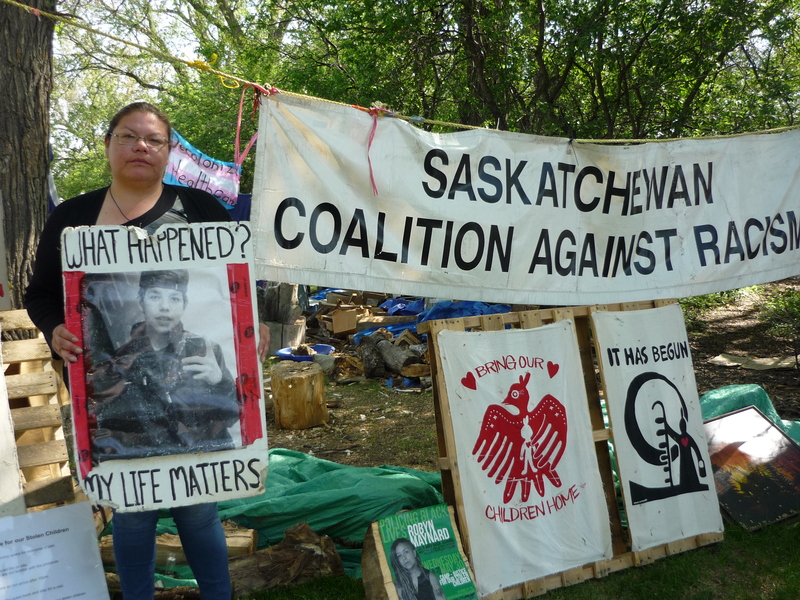 The camp was set up to demand justice for Haven Dubois. Richelle Dubois said she had to fight the justice system every step of the way just to get basic information. It was day 91 of the camp. They were going to stay there until the members of the legislature came over to talk to her. Dubois was willing to compromise. If they did not want to come to her camp, she was willing to meet them in the parking lot. It was halfway between her land and their stolen piece of it. The meeting was scheduled for 11:00 a.m. today. As we spoke a few more people entered the camp. I asked Dubois if I could take some notes and photographs. She said my blog publicity was better than no publicity. She got up and posed by the big sign, holding up the school portrait of her dead son. Dubois said she knew there was trouble as gang members had been circling her house days before her son’s death. That day he had left the house with his long skateboard saying he was hanging out with friends. After his death, and through the grapevine she heard that he was smacked about with the skateboard before hitting the creek. The coroner had noted the gash on his head but did not explain it. Haven Dubois would have graduated from high school this year. He would have turned 18 years old. In the past Dubois held an annual fundraising walk to honor his memory. She was tired this year. Instead she was holding an on-line fundraiser to set up a scholarship in his name. The scholarship was opened to anyone in the school. Back in the chair, I got talking to a man. I was so engrossed in the chat that I did not write down his name, thinking that I would remember it later. He said he was a warrior and prepared to camp out as long as it took to bring justice for Haven Dubois and the others. I asked him about the winter. He said the cold was a part of life in the province. You just deal with it the way you deal with life. He was joined by another man. They gave me a quick history lesson of the Klu Klux Klan in Saskatchewan. At one point the province had the highest number of Klan members in the country. Policemen, teachers and politicians were members. He said the justice system there had always been filled with drunks and racists. I looked my phone. It was time to go if I wanted to make my flight. Dubois said Regina was not like those big cities with taxis cruising around that you could just hailed one. She told me to sit while she called a cab. It would take about ten minutes. Another woman entered the camp. She was tall and tanned and lovely. She greeted Dubois with a hug and nodded in my direction. After she left Dubois asked if I knew about Colten Boushie. I said yes, there had been a vigil for him in Toronto. Boushie was sitting in a car when he was shot in the back of the head by a white farmer. The farmer was tried for murder. The jury said the he was not guilty, as he had killed Boushie in self-defense. The jury was all-white. The beautiful woman was Jade Tootoosis, Boushie’s cousin. The words collided in my head. Reading about an incident in the newspaper is one thing. It was easy to mull over its implications in an abstract sort of way, turn the page, and get on with the business of daily living. Meeting someone from in the newspaper was startling. The walking, talking, breathing woman had buried her cousin. His death was not an abstraction. Looking out the plane window it was the flatness and the geometric grid of the land that struck me. Saskatchewan seemed to be mile after mile of brown farmers’ fields all aligned in in straight lines. Nature does not like straight lines. Occasionally, the grid was broken by a river meandering and looping through it, its sinuosity a mockery of the grid’s rigidity. It was late May, the fields had not yet being sown. The land was shades of brown and beige. There were few trees and few lakes. It was such a contrast to my familiar Ontario landscape of lakes, forests and rivers. My seat mate too was on her way to the academic conference at the University of Regina. In the airport she bumped into a colleague who had rented a car. They offered me a ride to the university. He was a geographer and so I asked him about the land. He said the grid was done to drive Indigenous people off the land to make European settlement faster and easier. Dividing the land into numbered parcels induced settlers to come as they had the comfort of owning a plot long before reaching the area. The land looked too arid for farming to me. There were not enough rivers to supply the water and the lakes were mere puddles compared to those in Ontario. The geographer said the area was naturally semi-arid, prone to droughts, and the thick clay soil was perfect for hardy grasses but not for crops. Horses. They are not native to the Americas. Horses came with the Europeans, along with guns and smallpox. Another image popped into my head – the prairies filled with fields of golden wheat. It was the breadbasket of Canada. Wheat drinks lots of water to grow. Puzzled I asked the geographer where the water came from. He said it was siphoned from underground aquifers. I said those must be enormous to supply this thirsty land for over a century. The geographer said that was the problem. Saskatchewan was an ecological disaster. Europeans had fundamentally altered the basic ecology of the entire region. In the long term it was not sustainable. I saw many ‘bring back the buffalo’ posters scattered around the campus. Initially I thought it was a conservation group trying to undo the ecocide. When my brain finally woke up, I realised the significance of the buffalo. For millennia they were the anchor of Indigenous life in the prairies. Millions and millions of them once grazed in the province, feeding on the endless miles of tall grass. In a century the buffalo was nearly extinct. Slaughtering the animal was part of the government plan for clearing the land for white settlers. I was curious to go to Regina simply because the city was new to me. It was not on my bucket list – is it on anyone’s? – but it was the site of my first academic conference. It was a chance to present my research, meet other academics and hear the latest research and gossip. I wanted to see how academics have fun, and hoped that this was not an oxymoron. And it was an opportunity to explore a new city and check out its Black history. There is Black history in every area of Canada, sometimes you just have to dig hard to find it. In Saskatchewan, there was Alfred Shadd, a Black doctor, politician and farmer in 1896. Then there was Mattie Mayes and her family. They fled slavery in the USA to become pioneer farmers. Mayes was also a midwife in her community. In 1910 about a 1,500 Black settlers arrived in Saskatchewan, fleeing segregation, lynchings and the rule of the Klu Klux Klan in Oklahoma, USA. They settled in Eldon, Battleford, Maidstone and other tiny towns. I had planned to visit some of these Black pioneer churches and cemeteries before geography caught up with me. Saskatchewan is huge, and the nearest place was a four-hour drive. One-way. Canadian government officials even went on a media tour of Oklahoma, to convince African Americans that Canada was not a great place for them. Those who ignored the warnings were harassed at the border. White settlers in Saskatchewan got free land from the government. Black settlers had to pay. Saskatchewan’s Black community refused to disappear. A century later it is their descendants who run the on-line museum the Saskatchewan African Canadian Heritage Museum. The history, stories and photographs of the early Black pioneers are memorialized on the website. They came. They settled. And they are still here. The plan was to get up early enough to hear the dawn chorus of birds. Dawn comes early in the spring in Regina. At 4:00 a.m. I made it out of bed by 6:00 a.m. I meandered over to the First Nations University of Canada at the eastern edge of the University of Regina campus. To my surprise there were ten white teepees in front of the modern building. They sparkled in the early morning light. Arranged in a circle, the tepee were modern sculptures celebrating an ancient Indigenous past. My eyes followed the poles to the top of a teepee, guided by a flock of Canada geese flying by. Looking at the teepees it was easy to imagine villages of them scattered across the plains. They were the giants in a flat landscape, pointing to the big, wide sky. First Nations University has about 3,000 students. Some were part of the Indigenous drumming, dancing and meetings with the elders that were part of the social and cultural activities of the conference. A few hours later, I would bump into Richelle Dubois.